People have been using bee products, including honey, pollen, wax, and venom, for millennia. The first recorded instance of people collecting honey is documented in a prehistoric rock painting—which is nearly 9000 years old—found in Spain. With respect to medicine, Egyptian medical papyri from around 1550 BCE indicate that honey was used to treat wounds. Interestingly, Alexander the Great treated his hip pain with bee stings, and later, Charlemagne, the Frankish conqueror and Holy Roman Emperor who united much of Europe in the Middle Ages, was claimed to be cured of gout by bee stings. Bees, honey, and pollen are referenced in nearly every major scripture and culture, including the Talmud, Bible, and Quran as well as ancient scrolls from the Orient, Rome and Greece. Verily, bee products have been variously touted as nutritive food sources, health tonics, medicines, youth elixirs, and aphrodisiacs. Despite the bee being archetype, we still know little about the potential of bees or their products as medicine. 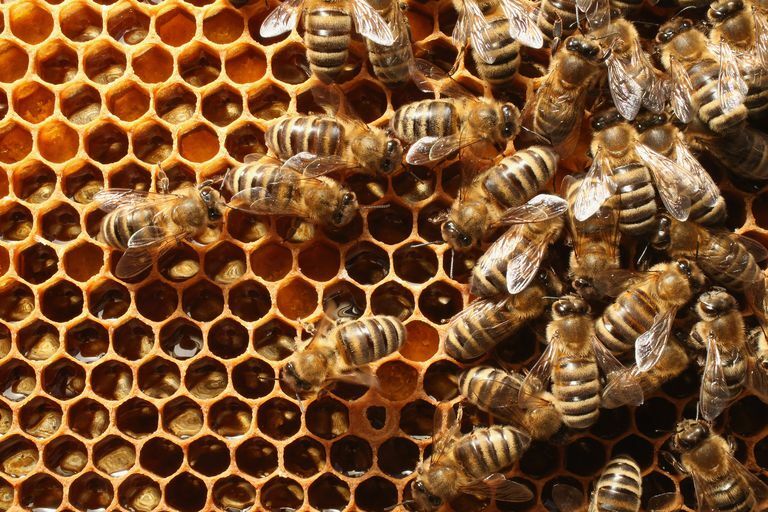 Up until 200 years ago, people still thought honey came from heaven, and it wasn’t until the late 1900s that scientists figured out the chemical composition of bee venom. The term apitherapy means the use of bee honey, venom, pollen and royal jelly as medicine. In this article, we’ll first take a look at the historical and anecdotal uses of these bee products. We’ll then take a look at some evidence-based research suggesting a few modern medical applications of honey. Honey is derived not only from honey bees but also stingless bees, honey wasps, and honey ants. Depending on the source, there’s great variation in the color and taste of honey. Honey has long been used to treat allergies; however, it’s been suggested that because allergies vary according to geography, the honey used must be locally harvested. Honey has antimicrobial properties and is used to treat external wounds and bed sores. Of note, there are two types of antibacterial agents in honey, which are called inhibines. Whereas one of these inhibines can be degraded by heat or light and is derived from hydrogen peroxide, the other is thermostable and doesn’t break down after the application of heat. Honey has also been used to treat a cough, ulcers, colitis and other gastrointestinal illnesses. Bee pollen is produced from flowers and is carried on the bodies of bees. Bee pollen is rich in free amino acids, sugars, and enzymes. Some experts herald bee pollen as a superfood. In fact, bee pollen contains 50 percent more protein than meat! Don’t know what propolis is? Propolis is the "cement" that holds hives together. Bee propolis is made of the resin that bees collect from plants and trees. Its composition varies based on season, soil, climate and type of plant. Propolis is chock-full of waxes, essential oils, vitamins (for example, A, B1, B2, C, and E), and minerals (for example, magnesium, copper, zinc, iron and iodine). Propolis has antibacterial, antiparasitic, anticancer and antiviral properties. Bee venom therapy (BVT) has a long history. It’s been used to treat rheumatoid arthritis for several centuries, first with live stings and then by means of injection. BVT has also been used to treat multiple sclerosis for decades. American physician Dr. Bodog F. Beck wrote an influential book titled Bee Venom Therapy. In the 1930s, this book inspired Charlie Mraz, a Vermont beekeeper, to start treating people who complained of arthritis using live bee stings. More than 60 components have been identified in bee venom, including compounds with antimicrobial and anti-inflammatory effects. BVT has been observed to not only treat symptoms but also slow the pathogenesis, or progression, of disease. BVT has been used to treat arthritis, post-herpetic neuralgia, and adhesive capsulitis. It is also incorporated into the practice of acupuncture. Please know that about three percent of people experience anaphylaxis, a life-threatening allergic reaction, after an insect sting. People who are possibly allergic to insect venom should avoid BVT. Royal jelly is more than 50 percent water and the rest is sugars and proteins. It has antibacterial and antifungal properties. Royal jelly has been used to treat hypercholesterolemia and osteoporosis, improve cognitive function and help with wound healing and tissue repair. All of the uses above chronicle how honey, pollen, and other bee products have been used to treat various ailments. However, the overwhelming majority of these treatments lack empirical support. Research regarding the use of honey to treat illness is still nascent, and a dearth of actual evidence exists supporting its uses. Nevertheless, honey has been studied as a treatment for certain conditions. Let’s take a look. Cough secondary to a viral upper respiratory infection (with no preceding infection) is exceedingly common among children. Nighttime cough is disruptive not only for the child but also for parents who lose sleep, too. Furthermore, children need rest to recover from infection, and cough robs children of this rest. In a bid to service parents’ desire to stop the coughing, various over-the-counter cough formulations are available, which contain antitussives (the word tussive refers to cough), decongestants, expectorants, antipyretics (fever reducers) and antihistamines. However, data suggest that these preparations offer no relief and can be dangerous. A Cochrane meta-analysis including 8 trials with 616 children with viral-induced cough suggests that OTC medicines used to treat cough don’t reduce frequency or severity of cough, sputum production or cough counts. Furthermore, dextromethorphan and diphenhyramine—two common ingredients found in OTC preparations—were found to be no better than placebo when relieving cough symptoms or sleep difficulties. Moreover, even codeine, which was long considered the best treatment for cough in children, has proven no more effective at treating cough than placebo. Children are particularly susceptible to codeine’s nasty side effects, including agitation, sedation, vomiting, troubles with breathing and heartbeat disturbances. Findings from several studies suggest that a single dose of honey may reduce cough and mucus secretion in children. Additionally, honey has proven more effective than honey-flavored dextromethorphan at reducing cough frequency, the annoying nature of cough and severity of cough. Honey has also been shown to improve sleep quality in both children and parents. Finally, the WHO has been recommending honey for the treatment of cough ever since 2001. Overall, honey is both safe and cheap, making it an enviable treatment. Please note, however, that honey shouldn’t be administered to children fewer than 12 months of age, because it can harbor Clostridium botulinum, which causes botulism, a rare illness that results in paralysis. Finally, honey given to children should always be pasteurized. A 2015 Cochrane systematic review authored by Jull and co-authors assessed 26 randomized and quasi-randomized trials that evaluated honey as treatment for any acute or chronic wound. In other words, honey does appear to help with wound healing; however, much of the evidence analyzed was low quality, biased and imprecise. On a related note, data from other research studies indicate that honey can help prevent wound infection and decrease inflammation as well as promote rapid healing and epithelialization of the wound site. More specifically, honey may stimulate monocytes to produce growth factors that promote healing. Anybody who has had their tonsils taken out as an older child, teenager or adult knows how painful this procedure can be. In addition to pain, hemorrhage or bleeding is another potentially serious adverse effect of tonsillectomy. Results from a low-power 2014 randomized-control trial by Iranian researchers published in the International Journal of Pediatric Otorhinolaryngology seem to indicate that honey helps with recovery after tonsillectomy in kids aged between 5 and 15 years old. This trial included 80 participants, with 40 assigned to the experimental group and 40 assigned to the control group. Participants in the experimental group were treated with antibiotics, acetaminophen, and honey after tonsillectomy; whereas, those in the control group received antibiotics and acetaminophen. There’s still much to learn about the potential of honey and other bee products to heal. Medicinal effects of these products are likely multifactorial and involve the following: osmotic effect, hydrogen peroxide content, nutritional content, antioxidant content, prostaglandins, nitric oxide, hydrogen peroxide content, and immunomodulation. Before taking honey, bee pollen, bee venom and so forth as treatment, it’s best to consult with your physician first. Your physician will help gauge the severity of your illness and symptoms and provide insight into the suitability of any potential treatments. Fratellone PM, Tsimis F, Fratellone G. Apitherapy Products for Medicinal Use. The Journal of Alternative and Complementary Medicine. 2016. Goldman RD. Honey for Treatment of Cough in Children. Canadian Family Physician. 2014; 60: 1107-1110. Jull AB, Callum N, Westby MJ, Deshpande S, WalkerC N. Honey as Topical Treatment for Wounds (Review). Cochrane Database of Systematic Reviews. 2015. Mizrahi A. Bee Products: Properties, Applications, and Apitherapy. New York: Springer Science+Business Media; 1997. Mohebbi S et al. Efficacy of Honey in Reduction of Post Tonsillectomy Pain, Randomized Clinical Trial. International Journal of Pediatric Otorhinolaryngology. 2014: 78:1886-1889.